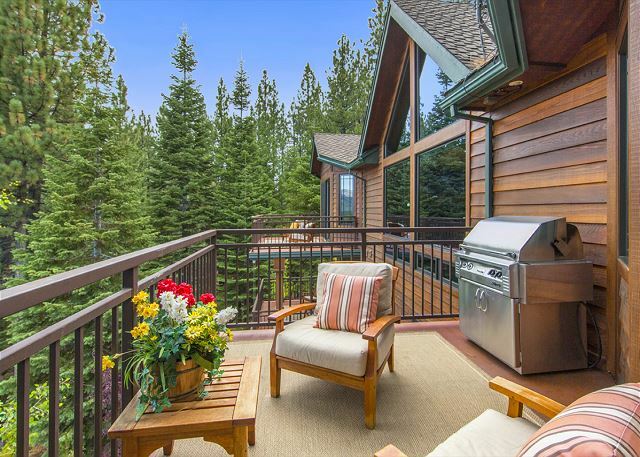 The Skyline Tallac Vista encompasses multiple living areas for family and friends to gather and private retreats to enjoy the peace and quiet. 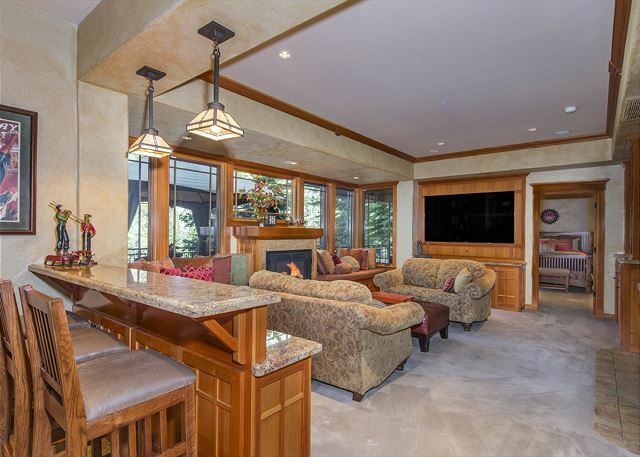 Each living area and each of the 5 bedrooms have views of Mount Tallac and the Crystal Range. The owners have crafted this custom, rustic yet elegant home to create a peaceful retreat for for friends and family to enjoy an escape to the mountains. As you enter through the grand front door your eyes are immediately drawn to the wall of windows and the spectacular views of Mount Tallac. This level includes a great room with high vaulted ceilings. The living area is accented by a gas fireplace, flat screen TV and views, views, views. The gourmet kitchen is anchored by a 6 burner gas stove, convection oven, expansive granite counters and comes well supplied for preparing family feasts. The dining room table seats 8 and there are 4 stools at the counter. The Tallac Suite on the main floor features a king bed, a private deck, a full bath with a steam shower unit, a jacuzzzi tub, dual sinks, and a gas fireplace. The Tallac suite has a television and a DVD player tucked in the armoire. 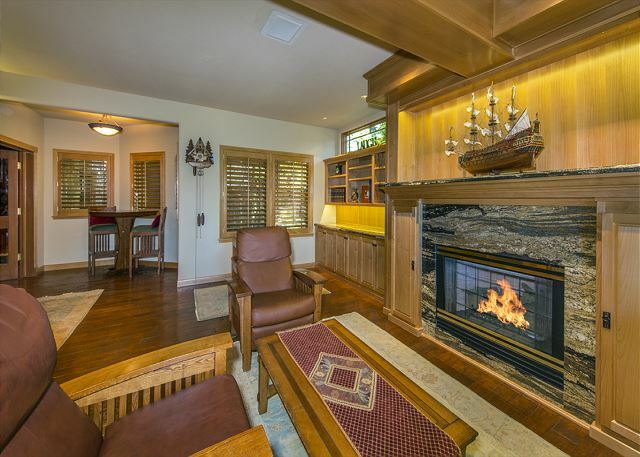 The second level has a sitting area in front of a gas fireplace, this room also includes a large desk for those of you that need to work while on vacation.The second level has a deck that runs the width of the house. There are two adjacent tables perfect for a game of chess or assembling a puzzle. As you pass through the French doors you enter a space that could be compared to a private club, dark woods and deep red walls create an intimate relaxing environment. 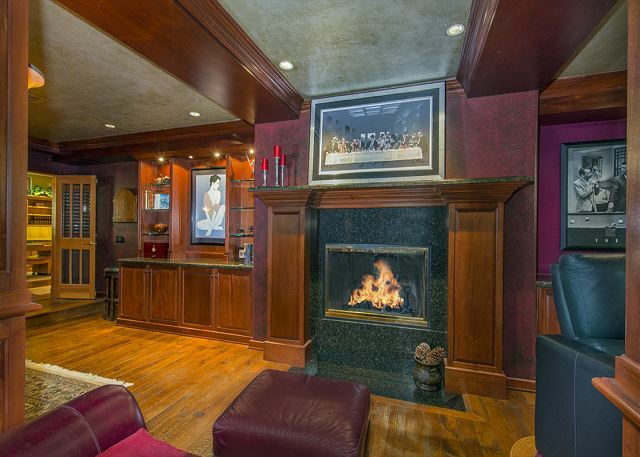 This space includes a full size pool table, a wet bar, gas fireplace, and a theater space. There are 7 theater style seats in front of a large flat screen. The hall off the sitting area leads to a full bath and 3 bedrooms. Bedroom 2 has a queen bed and incredible views. Bedroom 3 has a queen bed and more views. Bedroom 4 is a suite with a king size sleigh bed and an ensuite full bath with tile shower. The laundry room is located on the second floor. Down the stairs to the third level you enter a warm and cozy sitting area with a gas fireplace with window seats on either side. There is a selection of games and a flat screen TV. Next to the sitting area is another dining table that seats 6 and a microwave, sink and granite counter top. There is a pull down murphy bed. This level includes a sauna and steam shower unit, this area feels like a private spa perfect for relaxing after a day of hiking or skiing. The lower level suite has a king sized mission style bed, private bath with tile shower and access to the deck. In the summer time the fenced yard is a perfect spot for children to play. There is a full size Tee Pee with lights, a bed, seating and heater. Occupancy 10 (call regarding children 5 and under). The Skyline Tallac Vista is located in the Country Club Estates neighborhood, and is set on a 22,000 sq. ft lot. It is approximately 15 -20 minutes to Heavenly Mountain Resort, 20+ minutes to Sierra At Tahoe, 40 minutes (depending on traffic and road conditions) to Kirkwood Ski Resort. The community of Meyers is a few minutes away with several dining options: The Getaway Cafe, Divided Sky, Blue Dog Pizza, and grocery shopping at the Holiday Market. The only issue we faced was during the check in the key lockbox was broken and we had to wait for about 30 minutes until the management company came and open the door. I am sure the management team moved as fast as they could but it would be nicer if the issue was found and solved ahead of our arrival. We do apologize for the delay, we had checked the lock box two days prior and the buttons were all intact. We hope you enjoyed your stay otherwise.